Life is moving at a fast forward pace right now. From dawn to the time I crawl in to the bed, I cannot account for what I have done. While I seem to be doing a whole lot, nothing much seems to be getting done right now. Anyway, whining aside, this is a dish I would love to enjoy with some good wine and company. The recipe is an easy quick one – no rules to follow, no sauce to simmer, no time consuming prep work. Just use your favorite ingredients in whatever amount you want and do a quick stir fry. I love using citrus zest and I have used some here, along a tiny bit of the fresh lemon juice. A lot of olive oil, feta and artichokes and you have the most flavorful meal ever. Sprinkle salt, pepper and 1/2 tablespoon lemon juice on the shrimp and set them aside for about 15 minutes. Cook pasta in large pot of salted boiling water with one teaspoon of oil, until tender but still firm to bite- al dente. Drain. Save some of the cooking liquid. Transfer pasta to bowl and set aside. Add olive oil in skillet over medium heat. Add minced garlic and some crushed pepper and let the oil heat up. Saute the garlic and pepper until the garlic softens, but do not brown them – for about a minute. Add the marinated shrimp and saute for a couple of minutes. Add tomatoes and cook for a few minutes till they release the juice and softens. Add the artichoke hearts, rest of the lemon juice, and lemon zest. Add salt and pepper to taste. Cook until shrimp is just cooked through and turns opaque. Add the pasta to the pan. Toss cooked shrimp, artichoke, tomato mix with the pasta. Let the mix coat the pasta well and then switch off the heat. ( If the dish feels too dry, add some of the reserved cooking liquid from boiling the pasta.) Add the marinated crumbled feta to the warm pasta and toss. Garnish with fresh parsley. Drizzle more olive oil, crushed pepper and zest if you wish. 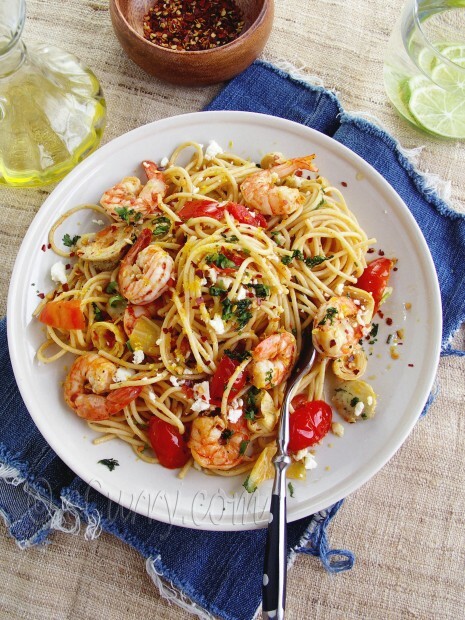 A gorgeous pasta dish¨What a wonderful combination of Mediterranean flavors. Soma- this looks like the perfect spring dish- light bright and airy. I hope preps for the trip are going well and that you get your visa soon. hope things are better for u soon. xoxo. 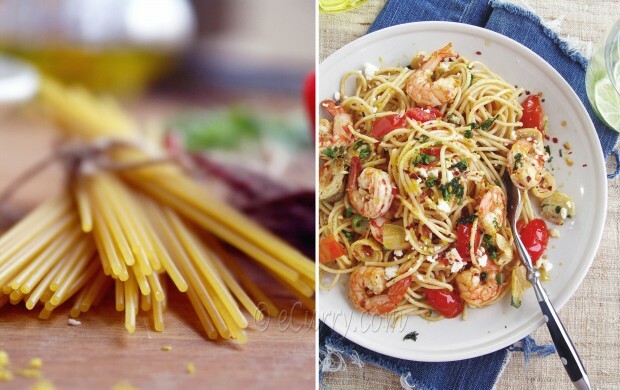 I love pasta in any way .. but mostly in a light refreshing way. I never used feta or artichoke in pasta before … would love to try this version! Love the usage of that blue denim cloth! 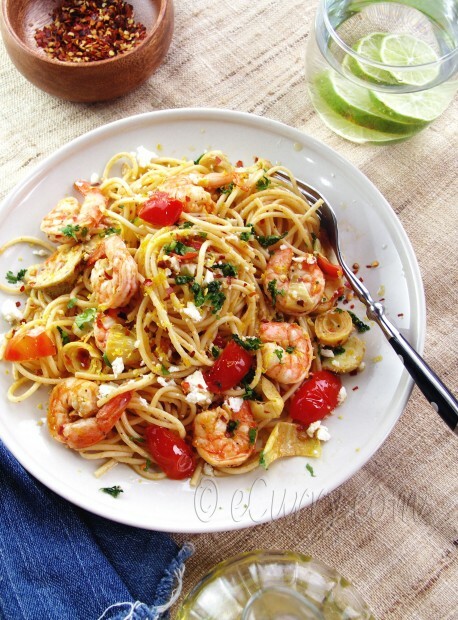 Pasta with shrimps is simply delicious and tempting. Clicks look great as well . Oh man! That looks sensational. 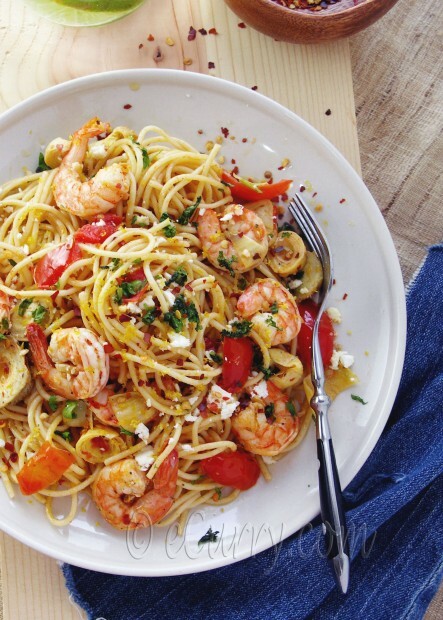 Pasta with feta is always a big win in my book. Thanks for sharing! What a beautiful dish,Soma!! !great spring recipe……fantastic flavors. Love the vibrant colours and great flavours! I don’t eat shrimp but whether you do or not what a feast to the eye. Beautifully styles and photographed as I am sure delicious. Hey Soma! Your Pasta looked very delicious! I went ahead, bought the ingredients and made it for dinner. It turned out delicious. Thank you! Delicious pasta and…. with artichoke, I call them a heavenly plate of pasta! It’s beautiful! I wish I could eat shrimps without needing medical attention ;-). I know this dish is delicious! I love everything about this dish. This is what I call perfection! When I make it I hope it looks half as good as yours!!! That would be a fulfilling meal- like the shrimp and pasta! These are some of my favorite ingredients all in one place! I love feta with shrimp. This is a perfect meal for me. What a gorgeous pasta dish Soma! I love all the colours and flavours. Wow – this is beautiful! Your photos are stunning. Wow, easy, fast and fresh. Perfection! Beautiful photo, too. Gorgeous dish! I adore these flavours, this recipe is bookmarked! This is my kind of pasta. My mouth actually dropped open to see you used all my favorite ingredients. Thanks for sharing! This looks delicious! Perfect summer dish. perfect for spring such a treat for eyes! looks amaaazing Soma! I made this dish for my family but substituted fresh orange juice and zest for the lemon. I marinated the shrimp in the juice and added the zest to the olive oil and garlic. It was a big hit and two pounds of linguine were devoured before you could say more please. The last time I made spaghetti nobody ate, maybe because they didn’t liked it. But this time around I’ll prove them I’m a pasta expert. Thanks for your blog by the way!! I made this for dinner….. very good! I just saw this photo on Pinterest and followed the link to the recipe! The image is gorgeous – no wonder it was in the top 100 on Tastespotting :-). The dish itself is very intriguing – all the ingredients are so simple, yet I never thought of putting them all together, like feta and shrimp, for example. I have to try this! By the way, I see that you are sharing your recipes on Tastespotting and Foodgawker, and I would like to invite you to check out our brand new site, and maybe share this post (and your other posts 🙂 ). It’s also a photo based recipe sharing platform, launched only last week. But on our site there is no approval of pictures: all recipe photographs are published within minutes of submission. And, of course, the images link back to the author’s site. It tasted more delicious than it looked. It one of the top ten pasta recipes I ever got my hands on. Wow! I made this tonight and it was truly delightful! I didn’t change much, just added a little extra liquid via white wine and some brine from the artichokes with a tad of water, there were going to be leftovers and it was going to soak up a lot of the juices, just delicious.